The Dutch artists have a specific place in art history, as they developed styles that were influential to so many other artists not only in the Netherlands but also in other parts of Europe. One of the best when it comes to Dutch landscape was Aelbert Jacobsz Cuyp, who was born in Dordrecht on October 20, 1620. His family were stained glass artists and painters and he received his training in art from his father, Jacob Gerritsz Cuyp, who excelled in portraiture and landscape painting. 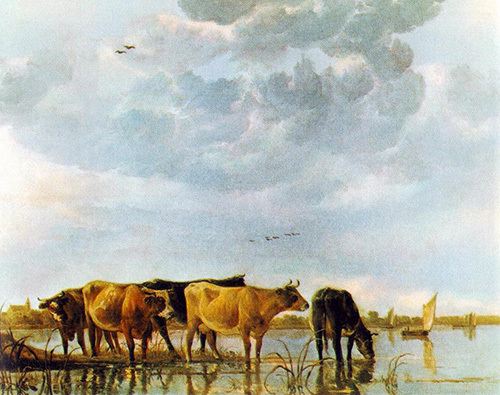 Although his early paintings showed the influence of his father’s style, such as in “Landscape with Cattle” that he did in 1639, Cuyp later developed his own style that showed influences from other artists such as Jan Both and Jan van Goyen. Aelbert Cuyp was one of the foremost Dutch landscape artists during the Dutch Golden Age in the 17th century. His finest works were peaceful riverscapes and landscapes that included calm animals, mostly painted during the early morning hours or in the late afternoon. His paintings had that special serenity in them, and he displayed his great skill in the handling of glowing light, in the Italianate style that he learned from classical painters including Claude Lorrain, a Baroque French painter. Cuyp was very popular in Holland and also gained interest from many art collectors in England. He also had an influence on the English School, the dominant landscape painting school in England from mid-18th century to mid-19th century. The Dutch Golden Age of painting spanned the 17th century, which flourished during the Eighty Years War for Dutch Independence. With Holland becoming a Protestant country, artists had to search for new subject matters as devotional subjects were not permissible. Landscape painting started to become the focus of many artists, which developed into two styles. The classical tradition that was popularized by Claude Lorrain showed ideal landscapes of the Italian countryside, imagined or real. The Dutch Realist style on the other hand showed actual landscapes, created by artists with great detail and accuracy. The Dutch Golden Age occurred during the era of the Baroque art movement, wherein many painting genres came to the fore: still life, landscape, genre painting, history painting, portrait painting and tronie – stock character in costume or portraits with exaggerated facial expressions, such as the works of Adriaen Brouwer which showed intensely expressed emotions, including pleasure, pain, joy or anger. Aelbert Cuyp painted seascapes and river scenes depicting a moist atmosphere that diffused the light into a soft golden glow to bathe his figures. He was masterful in showing this golden light on just the rims and edges of animals, clouds or vegetation, showing a calm and silent picture. He cleverly created scenes that showed things in harmony with nature and with a great sense of security and stillness. Cuyp was also a very skilled sketcher, as shown in his surviving samples of work. His excellent draftsmanship could be seen in his sketches of distant views of Utrecht or Dordrecht, shown in golden brown ink washes that were bathed in diffused light. There was no evidence that Cuyp left his hometown although he created drawings and paintings suggesting that he traveled along the Rhine and Utrecht. He married a wealthy widow in 1658, and delved into local politics and religious affairs, neglecting his art in the process. Cuyp signed several of his works, but most of them were not dated so the true number of his works could not be determined. While he did not have that much of an influence to his fellow painters outside of his hometown, his works, when rediscovered in the 18th century, became the favorite of collectors, particularly in England and the United States, where several of his finest works could be found.